Hi my lovely Fawn Friends! I have an exciting topic to share with you today and I know you will be just as thrilled as me to read all about it! Something new has developed in our household as of late last week while McKenzie was getting ready for her bath….Silence…. she said the word "Potty"! It went more like "Mommy Potty", "Baby Potty" while pointing to each one. 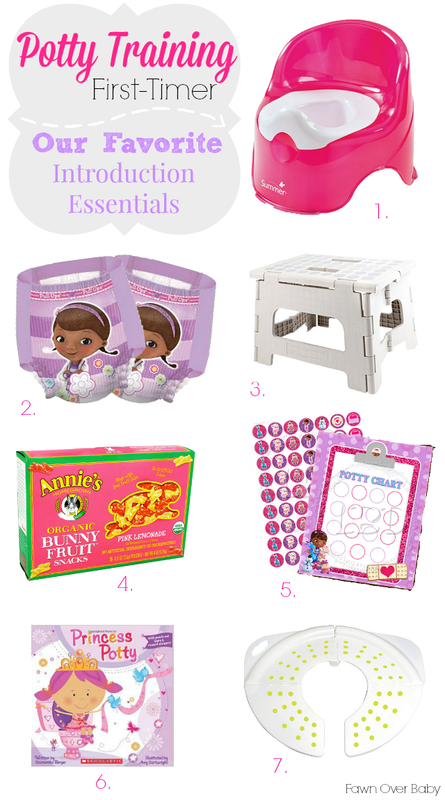 After reaching out to my fellow mommy friends, I received many wonderful tips and item suggestions to start off our potty training adventure. Many moms did say that their child preferred the big potty versus the little potty chair and a few praised the foldable potty seat cover for in-home and public use. Even though McKenzie doesn't seem to have an aversion to the little potty chair, I went ahead and purchased a foldable seat cover, as it would be perfect for when we are out and about. I bought McKenzie's potty chair a while ago as an attempt to practice "potty awareness". McKenzie basically uses it as another bath toy that she can sit up and down on or stick her foot in for a few seconds. I figured we would be a late bloomer when it came to potty training as her interest hasn't seemed to grow much since…until...last week! :D I never thought I would be this excited about potty training. I know it's only the short lived "honeymoon stage" that's talking, however there is something about hitting each milestone that has me in tears of joy and sadness all at the same time. Needless to say, I jumped at the chance to begin my research as soon as she went down to sleep that night. They fit like a glove and she didn't think twice about wearing them! She couldn't wait to tare through the bag to pull out another! What can I say? My daughter's feet are her feelers. She not only loves to stick her foot in her potty chair, she enjoys propping her foot up on her new bag of pull ups as well. I just can't get enough of those baby thighs though so prop away baby girl! I also enrolled Kenzie in the Pull Ups Big Kid Academy to help with our potty training preparations. This site is wonderful! It is full of potty training tips and helpful strategies to start both child and parent off on the right foot! Once you take the "signs of readiness" quiz, you then move on to their Big Kid Prep List as well as a generous collection of fun activities for day and night time training. The "potty-timer" app will also come in handy when creating a potty routine as her potty skills progress. Another neat thing about these pull ups, is the printed character begins to fade when they become wet allowing her see when she has an "accident". The night-time pull ups come with extra absorbency and a glow in the dark feature that make wearing these even more exciting! These baby thighs, I mean…. This is Kenzie pretending to take a nap with her new pull ups. I hope she never outgrows her fun and quirky personality. She has me laughing at some point or another every single day. I just love this child. When people used to say "Don't Blink! Before you know it, she'll be out of diapers." I would simply smile and nod not realizing how so right they are! Who knew we would already be in the beginning stages of working our way out of diapers?!? Time just flies when you have a little, so I'm really working on soaking up (pardon the pun) each and every milestone that passes - including potty training. If you're like me, in the beginning stages of potty training or need additional support that is fun and helpful, I highly recommend enrolling in The Big Kid Academy! 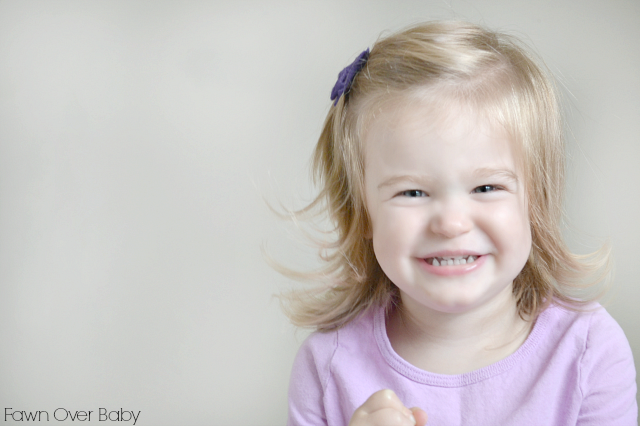 I feel much more prepared and confident about the potty training process, now that I have their site to lean on. And I know you will too! 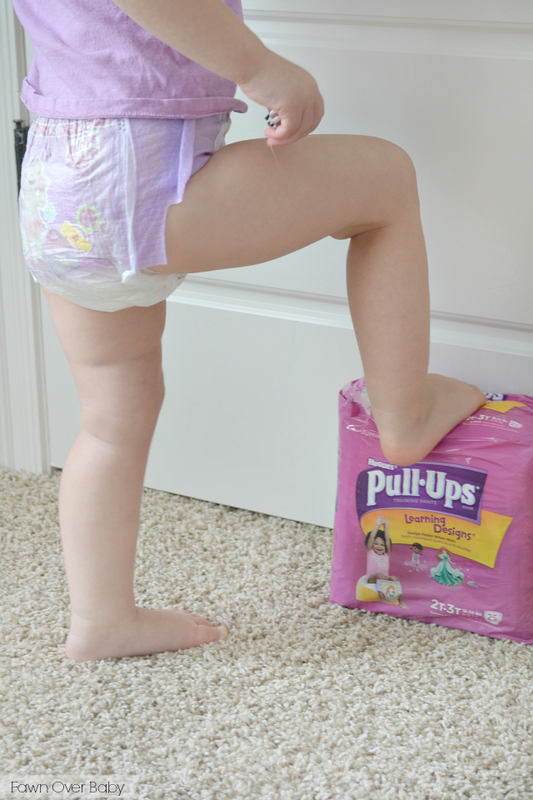 *Thank you to Pull Ups for sponsoring this post and creating The Big Kid Academy for all of us potty trainers! This is perfect right now! I'm starting to look into potty training techniques and I need all the help I can get...I'm clueless! That potty chair and seat are really cute too! I hear ya Amanda! There are so many wonderful ideas on The Big Academy Website - I need all the help I can get too, lol! She is so adorable! Love you inspiration board!! We are in the same boat over here. Thank you Chrissy! Good Luck! Let me know how it's going along the way!